Characteristics: enhance your CUNNING (other cards), enhance your INTEGRITY (other cards), enhance your personnel attributes (other cards), enhance your STRENGTH (other cards), manipulate your deck, "use" your discard pile. This Card-Review article was written by Michael Shea and was published first on "The Continuing Committee (trekcc.org)" at May 17th, 2018. ﻿DUKAT: That’s close enough, Garak. GARAK: I wanted to make sure the council members were safe. DUKAT: Hoping, no doubt, that your concern would curry some political favor? GARAK: Oh, and I take it your concern is motivated strictly by patriotism. DUKAT: Oh, the council members are well aware of my patriotism and the sacrifices I was willing to make in order to save them. Now, why don’t you go back to your tailor shop and sew something? GARAK: Because if the Klingons do invade this station, you just may need my help. Who would’ve thought that the two of us would be fighting side by side? DUKAT: Just remember when you fire that thing you’re aiming it at a Klingon. GARAK: I’ll try to keep that in mind. When Far Beyond the Stars was first approved for production, I was delighted to work on a set dedicated to my favorite series in the whole of Trek: Deep Space Nine. Deep Space Nine was always more comfortable dealing with darker subject matter than its predecessors, and if good science fiction serves as a means to allow comment on the human condition, then perhaps no single alien race better personifies the human capacity for deceit and amorality than the Cardassians. As a people, Cardassians prioritize power over truth. In Season Four’s two-part opener, The Way of the Warrior, Elim Garak, Plain Simple Tailor and Dukat, Military Advisor demonstrate this reality succinctly when they reluctantly agree to fight the invading Klingons together – not because of a shared sense of patriotism or loyalty or honor, but because both of them see an opportunity for personal gain in the situation, and each is willing to risk betrayal at the hands of the other or death at the hands of Klingon warriors in order to get what he wants. It's the very essence of the concept of the ends jutifying the means. With that in mind, I present The Enemy of My Enemy. The Central Command has long been a mainstay of Cardassian decks because its power to prevent stops is virtually unrivaled. But, Central Command is also a polarizing card because its perceived by many to be both overpowered and limiting to deck design. We wanted to give the Cardassian player another verb option to aid in mission completion, and the moment when Dukat and Garak stand side by side seemed a perfect thematic moment and inspiration. In order to play Enemy of My Enemy, the Cardassian player must expend resources, in keeping with a long-established theme of the species, by discarding three cards. If the attempt is early on in the game, there’s also a fair amount of risk involved as the discard of a useful personnel is far from certain. But, the rewards could be significant, as any skills, attributes, and keywords gained last until the end of the mission attempt. Imagine being able to use this new interrupt to give your Damar all of the skills, attributes, and keywords on your Nador, Curious Commander in order to help you avoid an unpleasant trip! While the inclusion of Enemy in any deck doesn't force the Cardassian palyer to abandon the unstopping power of Central Command, it does present a choice, and the potential to combat skill piles which tend to hurt the Cardassian player more. The attached deck has been designed to showcase the character of the Cardassian race and to be thematic and fun to play, but also effective. The dilemma pile is designed to kill as many opponent’s personnel as possible, hopefully buying the Cardassian player enough time to mount an offense. 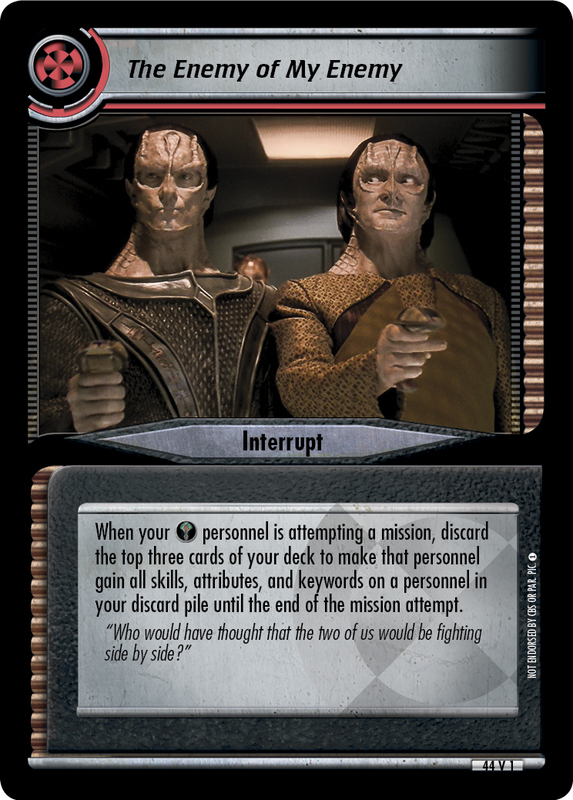 The draw deck is designed to provide the two-mission win by either discarding weapons at Kressari Rendezvous; or scoring off of Kotra whenever an opponent’s personnel is discarded on his or her turn using Davin , Dukat, Liberator and Protector, or Makbar, Chief Archon ; or scoring points off of Labor Camp after you spring the trap; or any combination thereof. See corresponding deck "The Ends Justify the Means" here! Enjoy, and stay tuned for more from Far Beyond the Stars!